Under The Copper Tree: Hello 2016! Most people celebrated the new year last night. My family celebrated this afternoon. Just family. I think the reason we pushed it back was because my grandma just got back from the Philippines and wanted to give her time to recover. She's okay, but my uncle that accompanied her came home pretty sick. But we celebrated anyways. I wanted to make at least one Filipino dish. I ended up making bopis, which apparently is also called igado. Pork heart cooked until tender and then chopped fine and simmered in a vinegar/annatto sauce with chopped chili peppers. Lots of oohs and ahhs, and all that remains is just a little for my sister when she gets back from work. I decided to break tradition and made a non-pancit dish - jap chae. The sweet potato noodles made for a nice change from the usual rice noodles we eat. 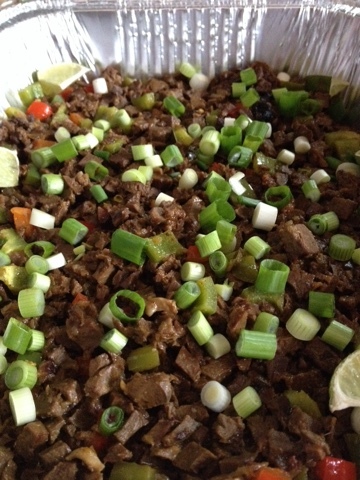 Several people asked for the recipe, but it can easily be made without one. Cook the noodles according to the package. Drain, rinse, set aside. Wilt a dark green vegetable (I used kale) and chop to bite size pieces. Sauté vegetables in a little oil and sauce made of soy sauce, sesame oil, sugar, chopped garlic, and white pepper. Sauté the kale in the same way and with the sauce. Add everything to the noodles and mix to combine. 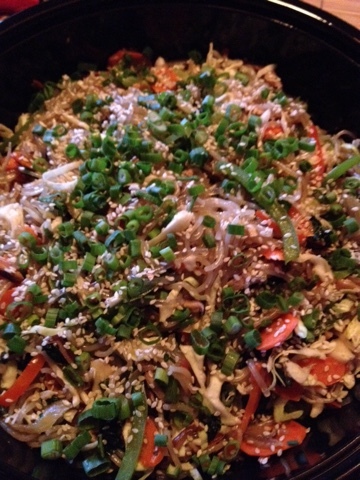 Top with scallions and sesame seeds. This disappeared quickly and I was asked to make this again for the next gathering. My mom asked me to bake a cake for an aunt to celebrate her birthday. She ended up not making the party, but my cousin brought a slice home so she can enjoy. 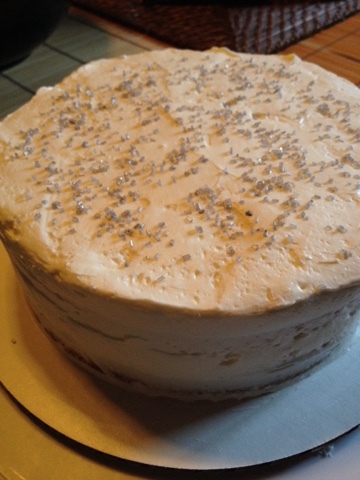 Nothing fancy, plain yellow cake. Made a stabilized whipped cream frosting, mixing in some cherry preserves for the middle layer. Never heard of a stabilized whipped cream? It's just whipped cream with gelatin added. Another request to make this for the next gathering. 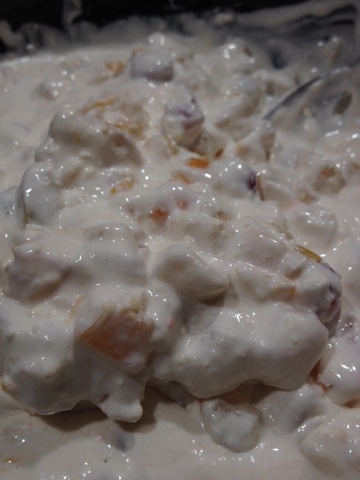 Another Filipino dish, fruit salad, that my dad used to make for parties. Cream base is made up of cream cheese, condensed milk, and whipped topping. Fruit cocktail, tropical fruit blend, and maraschino cherries comprise the fruits. I should make this into an ice cream. There's some karaoke action going on now... time to hide.